This year marks the 54th anniversary of the Philippine Press Institute (PPI), also known as the national association of newspapers. This milestone serves as a testament to the enduring two-pronged vision of PPI: 1) To defend press freedom (the significance of which nowadays cannot be stressed enough); and 2) to promote ethical standards within the ranks of its member-publications. “It is a feat that is both humbling and challenging, especially when we consider that this is happening at a time when our nation has been marred by crass partisanship and a maelstrom of populist rhetoric, made more intense by digital hyperactivity, the scale of which seems unprecedented,” said Alfonso Pedroche, PPI chairman-president. 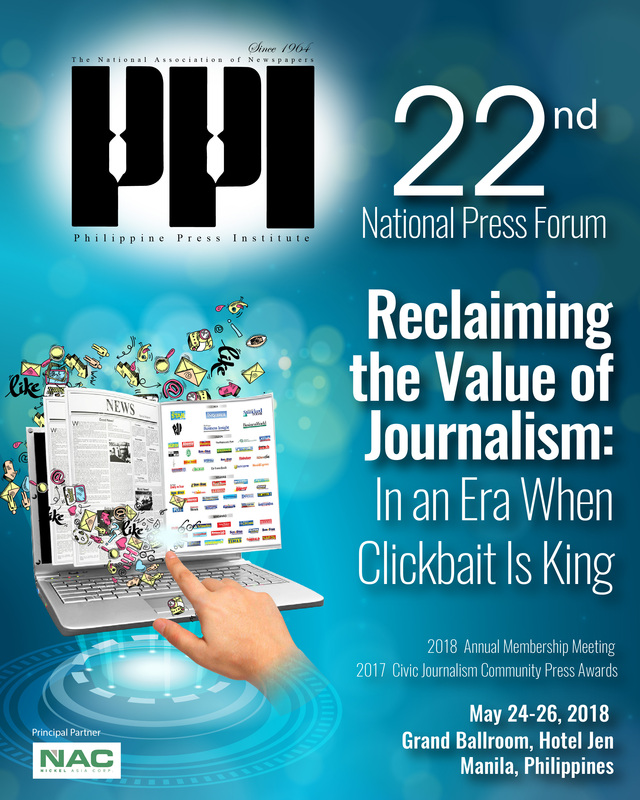 As in previous years, PPI is holding its annual National Press Forum on May 24 and 25 in Manila, not only in celebration of its founding but, more importantly, to bring together the members in a once-a-year opportunity to engage in meaningful discussion on an issue that matters to all of the Philippine media. The publishers and editors from the member-newspapers will be joined by guests from the academe, government, embassies, and civil society organizations. The theme for this year is “Reclaiming the Value of Journalism: In an Era When Clickbait Is King,” around which the PPI aims to have a discussion that, among others, will highlight how the media, the community press included, could reclaim and assert its role in today’s public agora, while upholding news as a public good instead of peddling it as a commodity in an atmosphere severely polluted by misinformation, malinformation, and disinfomation — telltale marks of today’s information disorder. “We need not belabor the fact that the media is in deep crisis in today’s digital ecosystem. Among others, it is battling growing public distrust, declining revenue that severely impacts its capacity to pursue good journalism, and the commodification of news that is anathema to serious journalism,” said PPI training director Tess Bacalla. Confounding these issues is the growing specter of threats to press freedom in a country that was once dubbed a bastion of a free and vibrant, albeit rowdy, press. Add to these troubling realities. she said, are the rise of an information disorder, where fact and falsehood are constantly at odds, or, worse, at times indistinguishable from the other. On its decision for the theme, the PPI Board took note with deep concern as well, the apparent decline of commitment to public journalism and a fundamental shift in the values attached to journalism. “Consider, for instance, the proliferation of click-bait news articles that leave readers feeling deceived once they have read the last paragraph of a story, or media reports that are far from fake news yet are misleading or dishonest, the measure of their value being virality, or number of ‘likes’ and ‘shares’, rather than their overall quality, measured in terms of accuracy, nuance, context, depth of analysis, and intellectual rigour,” said PPI executive director Ariel Sebellino. How can the media step up to the plate to bring about an engaged and empowered citizenry, who, despite divergence of opinion, rally around shared democratic values and commitment to public good? Are facts now a mere relic from the printing press era? Is there any doubt that the malady of ‘fake news is just the proverbial tip of the iceberg? The public’s loss of trust in the media, the marginalization of the traditional gatekeepers — including not only the media but also institutions like schools and churches (that used to mediate messages) — in favor of today’s social mediators, the role of human editors having been supplanted by algorithms, popularity as a measure of the value of news stories — these and more are symptoms of a far more malignant malady that deserves more than a casual treatment. These and other questions will be discussed during the conference by resource persons Atty. Florin Hilbay, Manny Mogato, and Ramon Tuazon. 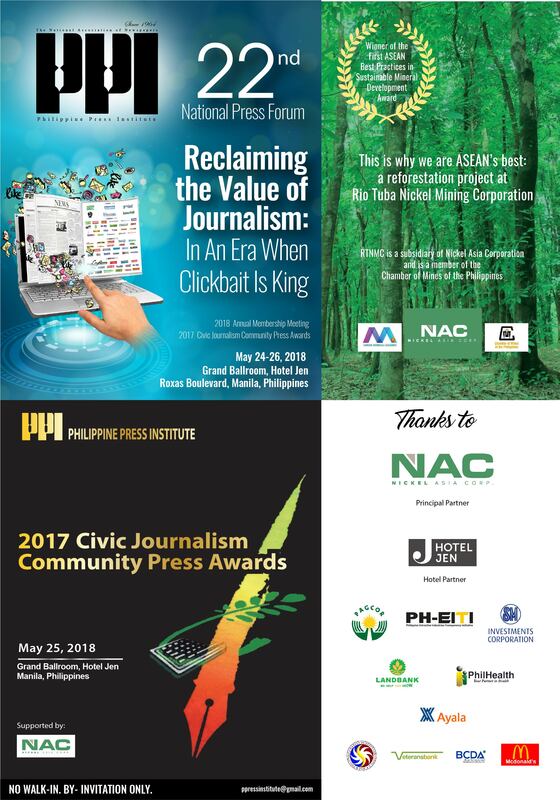 This year’s event is being supported by Nickel Asia Corporation as its principal partner for its civic journalism programs, and in part by PH-EITI, PAGCOR, SM Investments, Hotel Jen (hotel partner for two years), Land Bank of the Philippines, PhilHealth, Ayala Corp., PCSO, Veterans’ Bank, BCDA, and McDonald’s. The Civic Journalism Community Press Awards, now on its 22nd season will highlight the two-day event. There are nine dailies and 7 weeklies vying for five major categories, namely, best in photojournalism, best in environmental reporting, best in business and economic reporting, best editorial page, and best edited paper. The finalists are: Herald Express, MetroPost, The Mindanao Cross, Baguio Midland Courier, Samar Weekly Express, Baguio Chronicle, and BusinessWeek Mindanao for the weekly category; and Sun.Star Baguio, Cebu Daily News, Edge Davao, The Freeman, Sun.Star Bacolod, Mindanao Times, Visayan Daily Star, Sun.Star Davao, and Sun.Star Pampanga for the daily category.